The purpose of the Student Survey System (SSS) is to provide an easy way to survey students without using college IT resources. 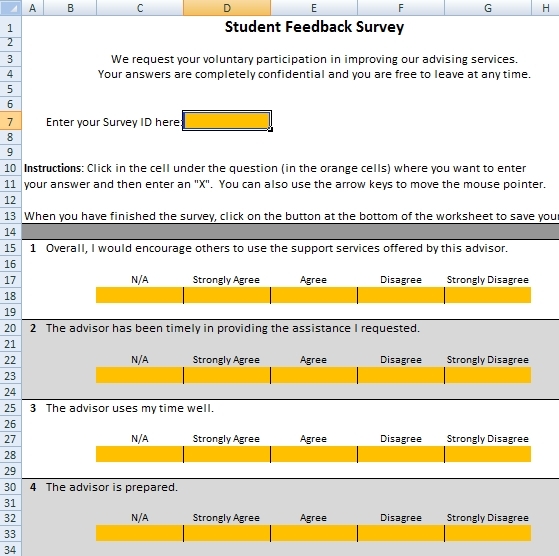 The software enables advising administrators to minimize the time needed in administrating Academic Advising surveys of students and to minimize the time needed to consolidate all the student surveys and report the results. The software consists of three MS-Excel files. A new MS-Excel file is created for each student taking the survey. The software can easily be changed to use your own survey questions (the SSS User’s Manual will tell you how). Sure, Survey Monkey or other software can be used instead, but using that kind of software has it’s own drawbacks and inflexibilities. This software is completely configurable by anyone who knows how to use MS-Excel.